Not Far Now and the weather has been very good to me. Most of the time I do not suffer bad weather, luckily being stopped or able to shelter from inclement weather. 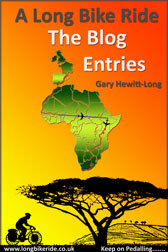 My luck continues to hold as I near the end of my African journey and as I move further along the coast and from the Indian to the Atlantic Oceans the weather systems change. Winds blow strongly mainly from the East or the West, the Easterly being my friend, the Westerly slowing me to a crawl as the coastal winds from the oceans buffet me to a near standstill. So far I have been on rest days for all but two of the worst westerly windy days. 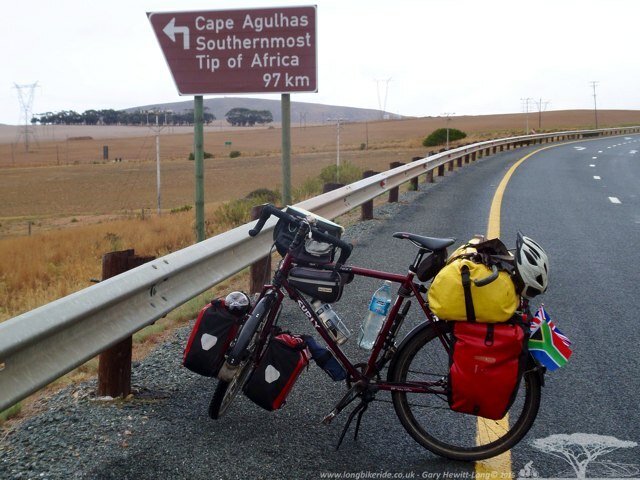 Not far now, cycling to the wine lands before Cape Town, Stellenbosch and Franschhoek. 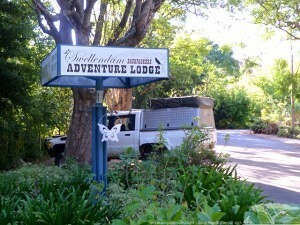 Arriving in Swellendam I headed to the backpackers showing on my map. Ringing the bell at the reception I was greeted by the owner and requested rates for camping, unfortunately no camping any more, they had stopped for safety reasons. Dorm Rates? 300 Rand per night.. This was more than I wanted to pay when other dorms charge around 130 so after a chat with the owners husband who knew Devizes quite well, apparently had gotten drunk there on a few occasions, I rode back out to the town to look for the municipal camp site. Stopping via the Spar on the way picking up some food for the evening meal and some “not 100%” Orange juice I headed to the camp site. The Camp site was close to the town centre and as I entered the gate it looked nice and clean. Behind the desk sat the receptionist, not showing much interest in my arrival and shuffling some paperwork as I enquired the nightly rate to pitch a 1 person tent. Barely looking up to say 180 Rand… Strewth, these municipal sites seem to be opposite of what happens in a French municipal sites which are cheap, backpackers camping cheaper still. The rates are based per pitch so had I been in a group then the 180R would have been a bargain. After a few seconds and with surprise at the price still showing on my face the lady turned to me to say “but if you camp next to the other cyclist over there, and he’s willing, you just pay him 90 Rand”. Walking from the office to go and find the “other cyclist” I catch a sight of a tall man I recognise, Rene from Holland.. He had already started on his daily bottle of wine and was happily or should I say merrily relaxing in just his speedos, most of the bottle already consumed! Camping in Swellendam – Sorry about the half naked Dutch Man – its the only way I could get a cheap rate! 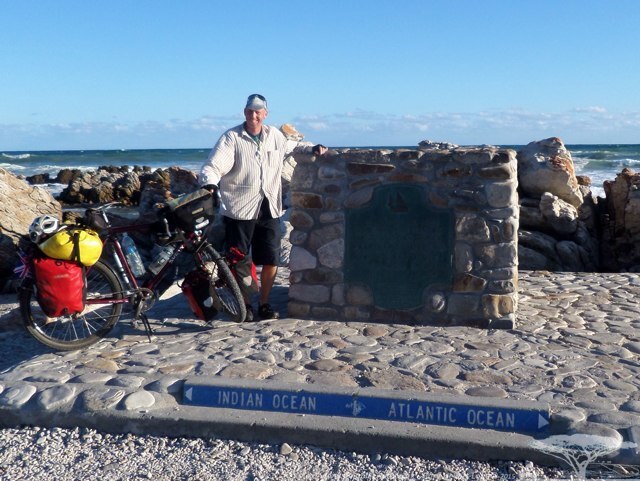 Next day the wind changed, a head wind as I cycled toward the most southern part of the continent, Cape Agulhas. The hills rolled but the wind made even the downhill seem uphill until I reached Bredasdorp where I stopped for lunch, fish and chips. 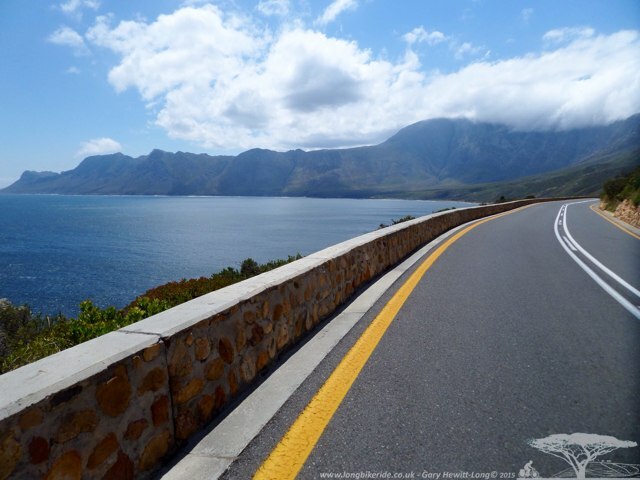 Many of the place names on road signs switch between the English and Afrikaans versions, one sign for example will read Gordons Bay, the next Gordonsbaai, Cape Agulhas, the next L’Agulhas, Cape Town and Kaapstaad. Confusing until I realised. Fish and Chips are reasonably cheap in South Africa, Hake and chips costing around the equivalent of £2.50, lunch consumed my journey continued, Bredasdorp however seemed to be the end of the rolling hills and the route flattened out, the wind dropped slightly and the going got a little easier. The backpackers in Cape Agulhas named Cape Agulhas Backpackers by coincidence.. was much cheaper, camping was only 80 Rand and the facilities were wonderful, a very clean modern kitchen, nice bar and lounge area with walls decorated brightly with flags from many countries and the camping spot right next to a pond had good shade. Setting up my tent I quickly headed toward the sea again and the furthest southern most point of the African continent, also where the Indian Ocean meets the colder water from the Atlantic Ocean. As I reached the edge of town on my way to the point I saw a man carrying what looked to be quite a large fish, stopping and chatting Johan explained he had bought the yellow fin tuna from the harbour, there was a marlin fishing competition on and this non target fish was cheap to buy and made nice fillets. Whilst I was riding back from the tip, Johan came by in a car with his father and aunt and invited me to supper. We enjoyed each others company with me paying for my supper by regaling stories from my trip. 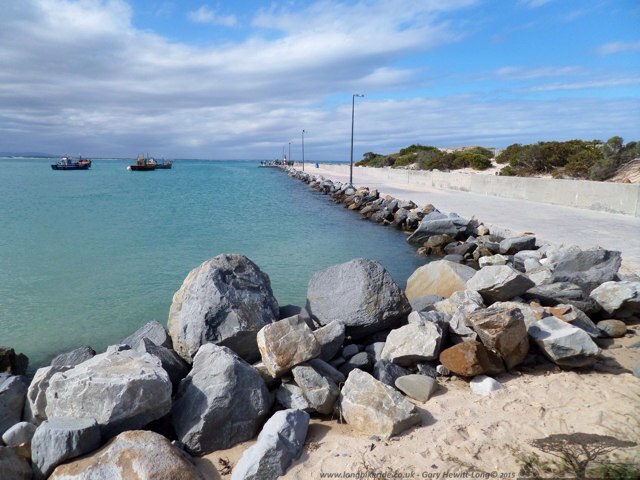 The Two Oceans Marlin fishing tournament held in Struisbaai in 2015 and held over 5 days, boats fished out at either 12 mile or 25 miles from shore. 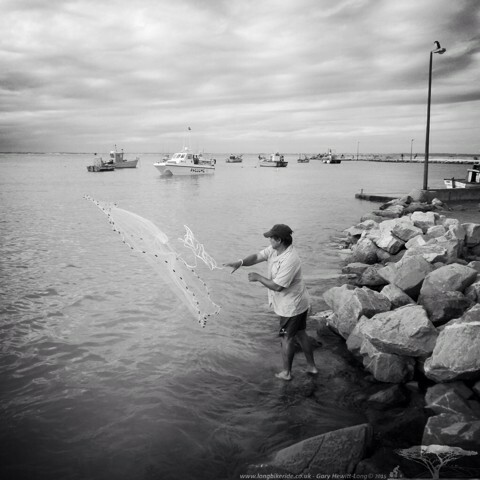 Along the harbour walls men caught small bait fish using a traditional throwing net, in places another fisherman threw in a chum bag with parts of fish in, crushing it underfoot before throwing the bag back in to leave a trail of fish pieces to attract more bait fish. 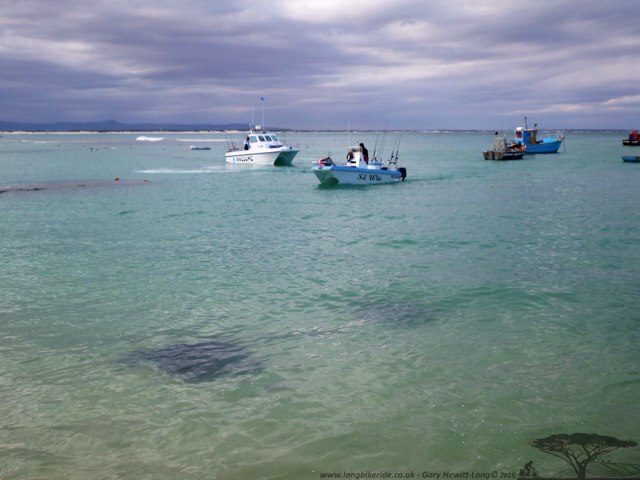 The harbour in Struisbaai is resident to some stingrays that live off of the unwanted fish from the boats, apparently they are tame and tourists are able to by fish to feed them, getting in the water and the rays will take the fish with their toothless mouths. Boats came in from the days fishing for big game, many hadn’t caught their intended prey, Marlin. Any that had caught display a flag depicting a marlin on it, the competition was strictly catch and release. 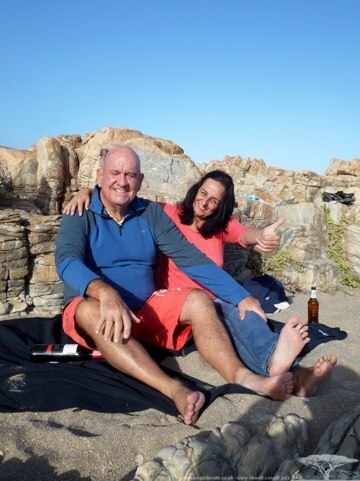 After a days resting and looking around Struisbaai there was a question I needed to answer, “dirt track or no dirt track?”, if I wanted to stay on tar all the way then I needed to rde substantially further, back toward Bredasdorp and then take a left to Gaansbai. 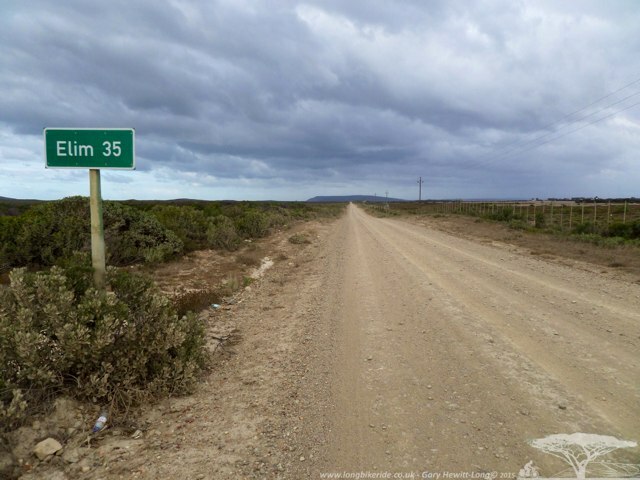 If I took dirt I could turn left just after leaving Struisbaai and take a dirt road to Elim. I chose the dirt road. For the most part the dirt road was reasonably smooth, the shrubs either side of the track took the edge off of the wind allowing me to build up a good speed despite the occasional hole or large rock that had to be negotiated along the way. Further ahead I saw Ostrich by the side of the road, a car coming around the corner quickly braked to avoid hitting them, the damage to the car would have been substantially more than hitting a bird back in the UK. 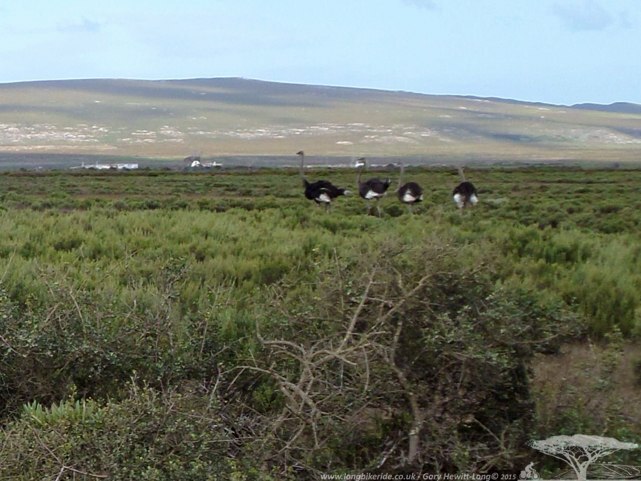 As I neared the birds, most of them strutted at speed off into the veld but one young bird became detached from the rest and started strutting up the road, first one side, then the other with it’s wobbly gait reminding me of Bernie Clifton. 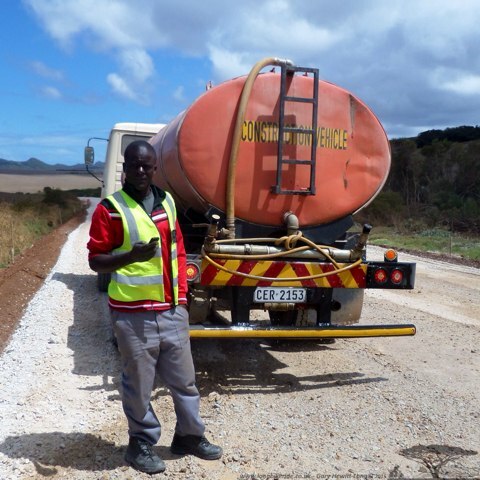 As I passed Elim and rode onto a closed road, supposedly to have been finished surfacing by 2012, men carried on working, three men stood around doing nothing whilst one other casually moved some loose stone near the edge of the road. Unsure whether to head directly to the sea or take a route through Baardskeerdersbos I asked a water tanker driver who had stopped to turn the taps off. The young Zimbabwean Gift explained the best route to me, to continue through the small village ahead and it would soon turn back to tarmac. Whilst talking he explained that he had come to South Africa to work, there was little work for him in his own country. When I asked him about his thoughts on President Mugabe he became agitated and explained that his president was a liar and didn’t help the people, since many of the white people had left there were less opportunities and as a result he was now far from his family in South Africa, earning 1,000 rand (£58) for 6 days work driving the lorry. Dropping down toward the sea again I was soon cycling through Gansbaai before I had realised it. 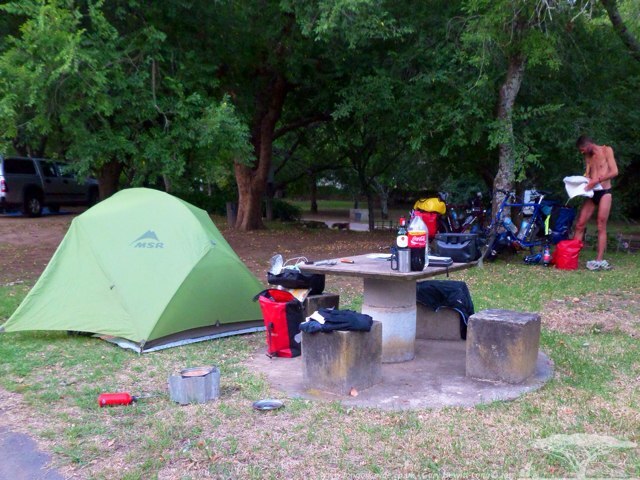 I had planned to stop in a backpackers to camp or stay in a dorm, as I had already passed I phoned to check availability before cycling back. Luckily I had phoned, all of them were fully booked. 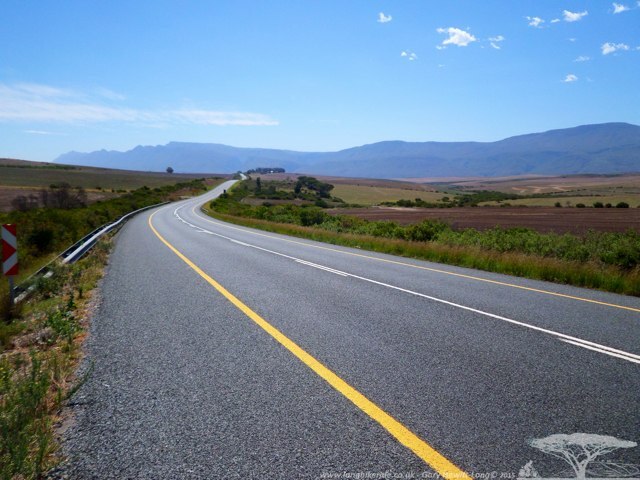 The time was still good so I continued toward Hermanus. Stopping in Hermanus overnight at another backpackers who were also full, they offered me what they called “The Wendy House”, a garden shed. The Garden shed at Zoete Inval Travellers Lodge was surprisingly comfortable and Paul who worked there ever so friendly and helpful. 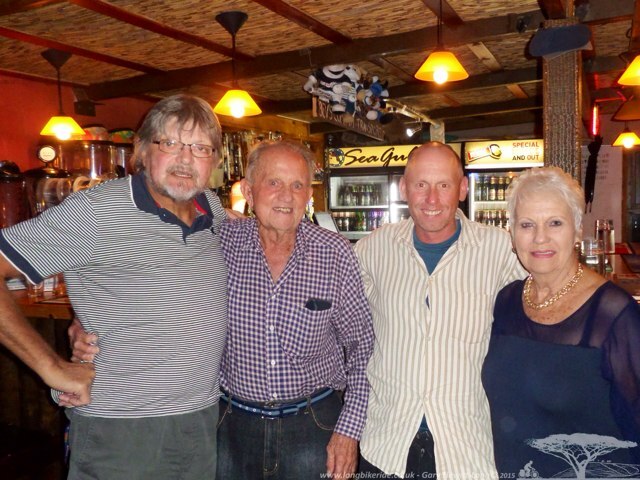 Previously my friend Peter back in the UK had put me in touch with some more of his South African friends, Klem and Ginoca in Kleinmond (not to be confused with Kleinmonde near Port Alfred). A very leisurely ride from Hermanus to Kleinmond found me arriving quite early. 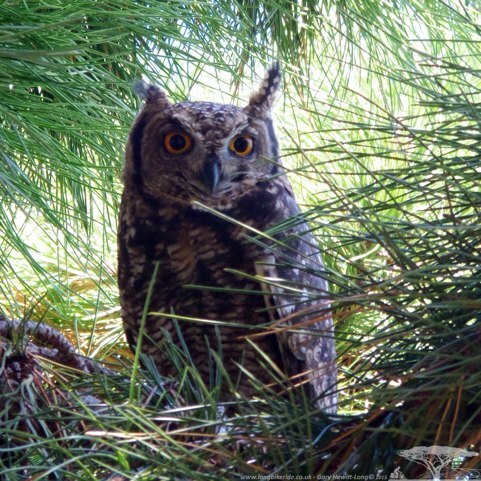 Both Klem and Ginoca greeted me warmly and after being handed a beer showed me the owls living in their back garden. 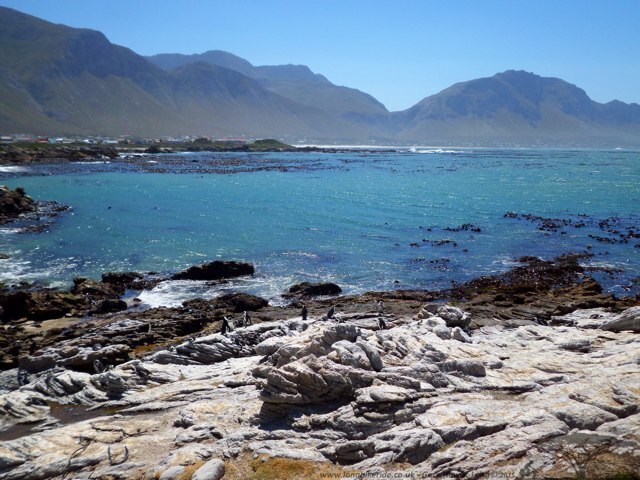 Kleinmond is close to a colony of Cape Penguins who have made an old whaling station there home. One doesn’t think of penguins too often being in such warm climates, normally pictured with ice and snow. 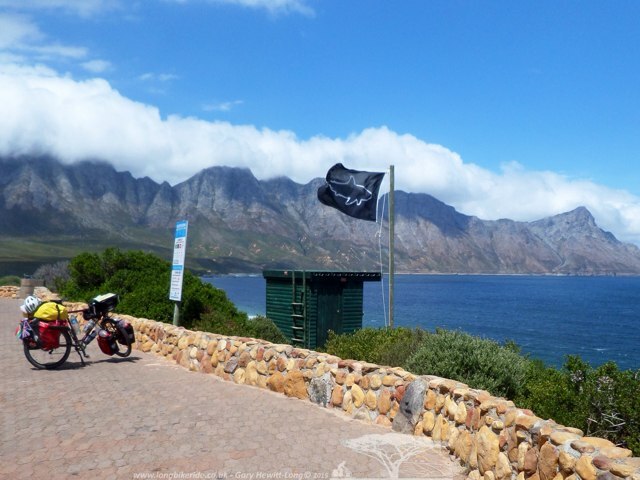 The viewing platform and signs explaining the wildlife put there by Cape Nature were excellent at explaining the wildlife and for minimising the impact on the wildlife of tourists wanting to come and see them. 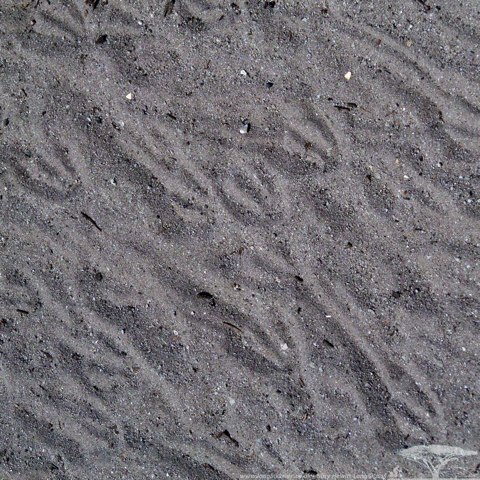 Penguin Foot Prints – how cute..
During my stay it was Klem and Ginoca’s wedding anniversary, they arranged a romantic picnic by the sea which I was invited to. I went for a walk, both to have a look around and to give the couple some time on their own, I’m sure they didn’t mind me being there but an anniversary should be celebrated by two, not three. The wind hadn’t died down too much and the sea crashed over the rocks just in front of the pathway, wonderful white horses atop the waves as they rolled in toward the rocky shore line. 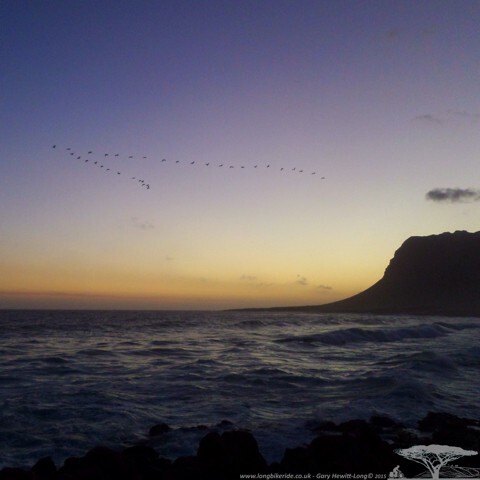 As the sun set over the back of the mountain, geese and cormorants flew in a V formation back toward their roosting sites, the trailing birds continually correcting their course to stay in position whilst battling the effect of the winds. As they flew over they repeatedly switched places, working together to minimise the effects of the wind and improve efficiency, a natural chain gang, far better rehearsed than many a club ride. 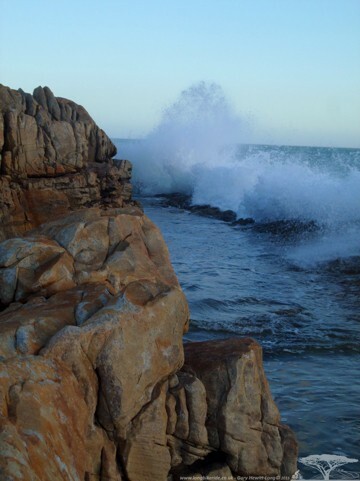 Kleinmond to The Strand follows over 21km (13 miles) of coast, the mountains rising up to the right and the sea and rocky shoreline below. Despite the tailwind I slowed on purpose to take in the views, smell the sea and soak in the sun, with perfect tarmac and lots of well maintained pull off places I was in no rush. Sat on the edge of the rocks and by a pull in was a black flag with a shark depicted on it, Klem had told me there would be flags for shark spotting. As I pulled over to see what the colour meant, hoping it would say sharks everywhere, I was disappointed to read that black meant poor shark spotting conditions, it didn’t stop me looking out hopefully to see a fin breaking the surface. Stellenbosch in an area known as the winelands, not hard to see why, there are vineyards all over the place. Stellenbosch also has a large student community with a University being based there. I was stopping with Emmerentia whom I had met through the cycling hosting website warm showers. Emmerentia was very modest about her cycling and casually mentioned she’d ridden Audax rides, not just any Audax though, both LEL (London – Edinburgh – London approx 1,400km – 870 Miles) and PBP (Paris – Brest – Paris approx 1,200km – 745 Miles), both very challenging rides, you don’t take a tent and camp when you want like touring. In the evening we went into town, there are so many bars and restaurant to choose from and a growing craft ale scene. Plenty of beer to choose from and a vibrant atmosphere along with my host made for a nice evening out. 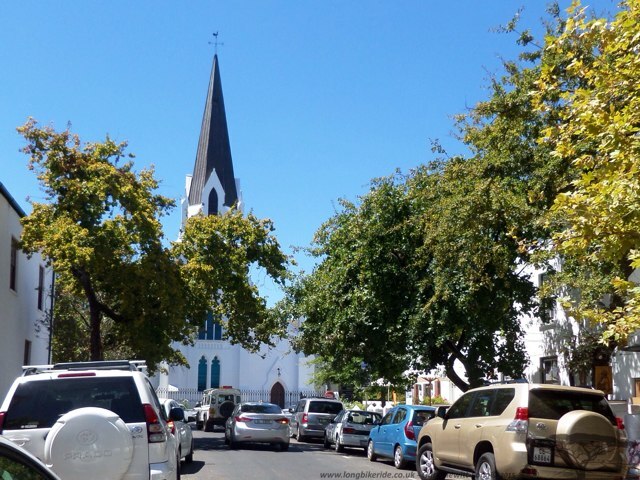 Stellenbosch is full of oak trees, very pretty and they are everywhere and Emmerentia explained that it’s known as the city of oaks, Eikestad in Afrikaans. 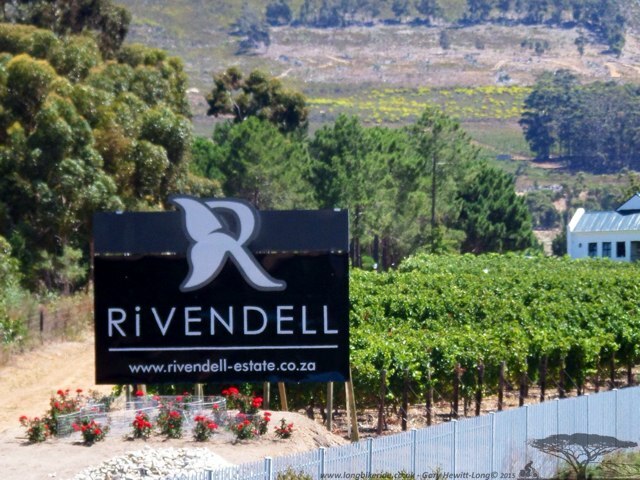 One of the many tourist things to do around the area is to go wine tasting, Emmerentia gave me a booklet of vineyards in the area and recommended one called Spier, just a short ride away. Tasting of wine only is cheap, 35 Rand a tasting session for 5 small wine glasses or you can go for more and pay a little more and you can add chocolate to the wine..
Not Far Now, the end is in sight and I have mixed feelings, with anticipation looking forward to seeing family and friends after nearly 10 months on the road but also with apprehension. 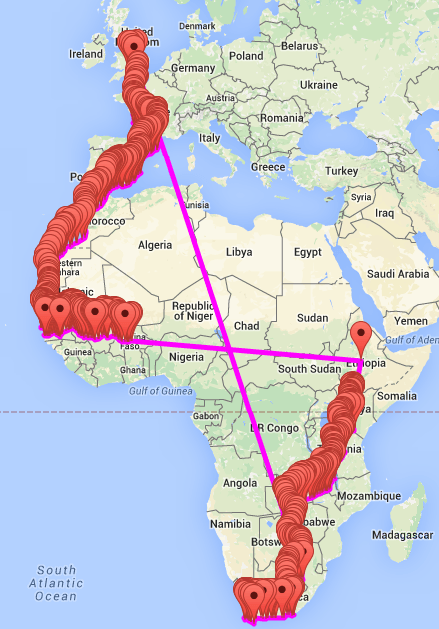 The end felt a long way off and now I’m coming to the end of Africa, it’s getting closer.